The right of individuals to vote by secret ballot is fundamental. The right to cast a secret ballot in a public election is a core value in the United States’ system of self-governance. Secrecy and privacy in elections guard against coercion and are essential to integrity in the electoral process. Secrecy of the ballot is guaranteed in state constitutions and statutes nationwide. However, as states permit the marking and transmitting of marked ballots over the Internet, the right to a secret ballot is eroded and the integrity of our elections is put at risk. [T]he General Assembly may by law prescribe the means, methods and instruments of voting so as best to secure secrecy and the independence of the voter. Thirty-two states and the District of Columbia allow some form of Internet voting – transmitting votes either via email, electronic fax, or Internet portal – typically for use by overseas and military voters. Because of current technological limitations, and the unique challenges of running public elections, it is impossible to maintain separation of voters’ identities from their votes when Internet voting is used. Most states that offer Internet voting recognize this limitation and require voters to sign a waiver of their right to a secret ballot. The authors believe that Internet voting creates a second-class system for some voters – one in which their votes may not be private and their ballots may be altered without their knowledge. This report examines state laws regarding the right to a secret ballot and the ways in which states are asking voters to waive that right. We also offer recommendations for how voters and officials can preserve privacy in voting while making use of the Internet and technological advances. Our findings show that the vast majority of states (44) have constitutional provisions guaranteeing secrecy in voting, while the remaining states have statutory provisions referencing secrecy in voting. Despite that, 32 states allow some voters to transmit their ballots via the Internet which, given the limitations of current technology, eliminates the secrecy of the ballot. 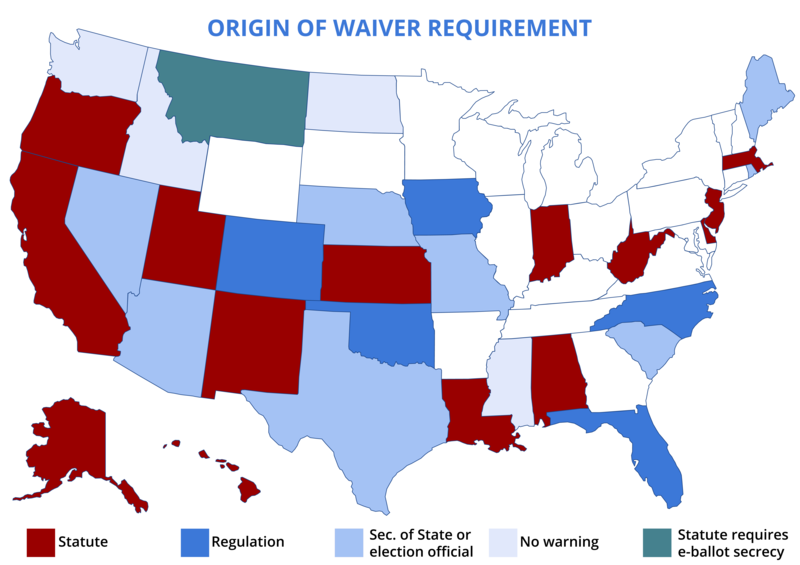 Twenty-eight of these states require the voter to sign a waiver of his or her right to a secret ballot. The remainder fail to acknowledge the issue. 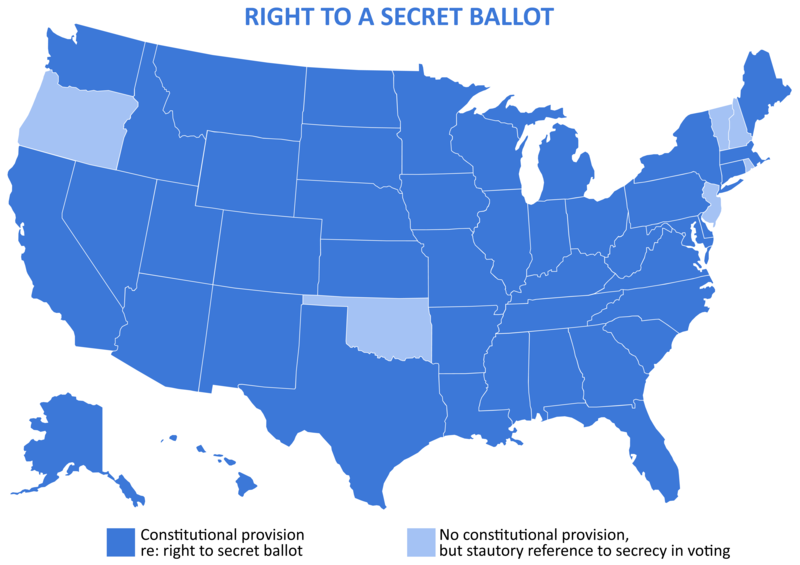 Forty-four states have a constitutional provision guaranteeing secrecy in voting (AK, AL, AR, AZ, CA, CO, CT, DE, FL, GA, HI, IA, ID, IL, IN, KS, KY, LA, MA, MD, ME, MI, MN, MO, MS, MT, NC, ND, NE, NM, NV, NY, OH, PA, SC, SD, TN, TX, UT, VA, WA, WI, WV, WY). The six remaining states, and the District of Columbia, have statutory provisions referencing secrecy in voting (DC, NH, NJ, OK, OR, RI, VT). All 50 states and the District of Columbia have legislated specific exemptions to secret voting, mostly to allow voters with disabilities to request assistance in the voting booth, should they wish it. This narrowly tailored exception demonstrates the priority state legislators have placed on ballot secrecy. 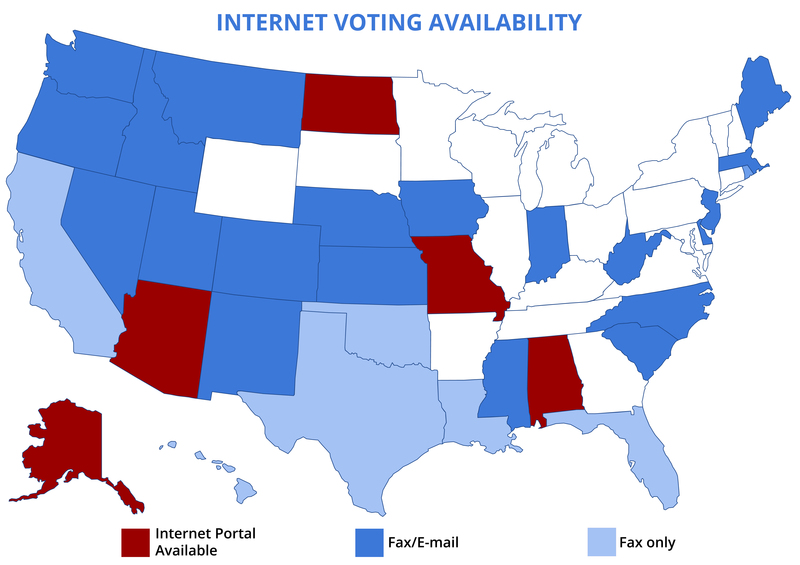 Thirty-two states and the District of Columbia offer some form of Internet voting (e-mail, electronic fax, or online portal) to at least some subset of voters. For most states this exception extends only to overseas and military voters. (AL, AZ, CA, CO, DC, DE, FL, HI, IA, ID , IN, KS, LA, MA, ME, MO, MS, MT, NC, ND, NE, NJ, NM, NV, OK, OR, RI, SC, TX, UT, WA, WV). In Alaska, all absentee voters can vote via the Internet. In Utah, voters with disabilities are also allowed to use the system. One state has a statutory requirement that votes cast over the Internet "remain secret" as required by the state constitution (MT), despite the fact that this is technologically impossible. The authors support the use of the Internet for a variety of positive purposes in elections. The Internet can support voter registration. Voters can track ballots, obtain information about polling places, wait times, candidates and issues, and much more. The Internet can also be used to seek and receive a digital blank ballot that can then be printed out and returned via postal mail. The transfer of blank ballots to voters is reasonable and does not risk voters' privacy or election integrity; indeed, a key provision of the Military and Overseas Voter Empowerment (MOVE) Act of 2009 was to require all states to allow voters to request and receive blank ballots via electronic means. We recognize that in some situations, it is challenging to return a ballot via postal mail. The MOVE Act was passed largely to address that issue. It is important that all voters – including overseas and military voters – should have access to traditional absentee mail-in ballots. These ballots do not require a privacy waiver. Our concern lies with the transmission of marked ballots via the Internet. The Internet can support voter registration. We need look no further than the warning all Alaska voters receive if they use the online voting system to cast their absentee ballots. Alaska acknowledges that the system is insecure and may not work, warning voters that “[w]hen returning the ballot through the secure online delivery system, your [sic] are voluntarily waving [sic] your right to a secret ballot and are assuming the risk that a faulty transmission may occur.” A similar warning on a physical polling place voting system would be considered unacceptable. For some overseas and military voters Internet voting may seem more convenient, but until technology advances to a point where it can be done securely, the risks are overwhelming and it should not be an option. Our elections are too important to gamble on. We hope that this report will illuminate the issue of the erosion of the secret ballot, and highlight solutions for states that wish to offer alternative voting options to its citizens. Engage your state policymakers in a conversation about the importance of the secret ballot; share this report with them. Protect your secret ballot by marking and mailing your printed ballot, avoiding using fax, email or an Internet website or ballot marking portal for anything other than requesting (and if desired, receiving) the ballot. If you are a military or overseas civilian voter, your voting process starts earlier than for voters who are not overseas. Get your ballot early: Request your absentee ballot today—it will be sent out 45 days prior to Election Day! Contact your local election official back home, FVAP.gov, or your voting assistance officer (VAO) to find out how. Get your ballot faster: You have the right to receive your blank ballot electronically if you request it. This will give you more time to get it back safely. Mark the printed ballot to safeguard the secrecy of your choices. Don't mark "online." Mail the printed ballot back. Even if offered, avoid fax, email or uploading your votes to a website or Internet portal. If you are a military voter, you can get express return for your ballot at no cost to you. Use the special 11-DoD label. Your ballot should arrive stateside in less than a week, and you can track its progress all the way back. If you are a non-military/overseas voter voting absentee, check with your election official about how to vote absentee in your state, and when absentee voting begins. Check early so that you can be ready. Safeguard your privacy. Even if offered, avoid the use of an online method for marking and/or transmitting votes. Marking ballots without the use of a connection to the Internet is the best way to keep your vote secret. Use an inner privacy envelope when mailing back your ballot, and don't sign the ballot itself! Sign only where instructed. Mail your ballot back promptly, or if available in your state, drop it in a secure ballot drop-box or at the elections office. Some states let you track your ballot to be sure it arrives safely; check with your local election official. Remember, the availability of an online method for marking and transmitting votes does not mean that system is secure, nor that votes will be private, including systems offered in states where a waiver of ballot secrecy is not required. We would like to acknowledge the Rose Foundation for Communities and the Environment who provided the necessary seed money for this project. We would also like to thank the John D. and Catherine T. MacArthur Foundation, the Rockefeller Brothers Fund, Deer Creek Foundation, and the Philip and Janice Levin Fund.